Since the front skirts are in pretty good shape, I can start working on the side skirts. 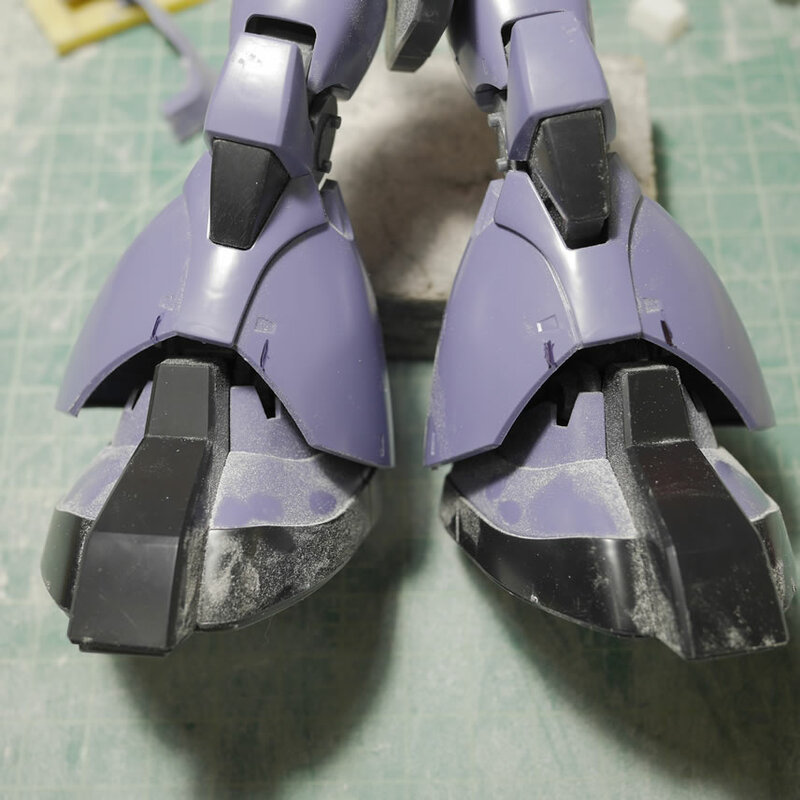 I cut into the side skirt (the area I had originally cut from the original front skirt piece and glued to the side skirts) to allow for the bigger missle pods to fit. 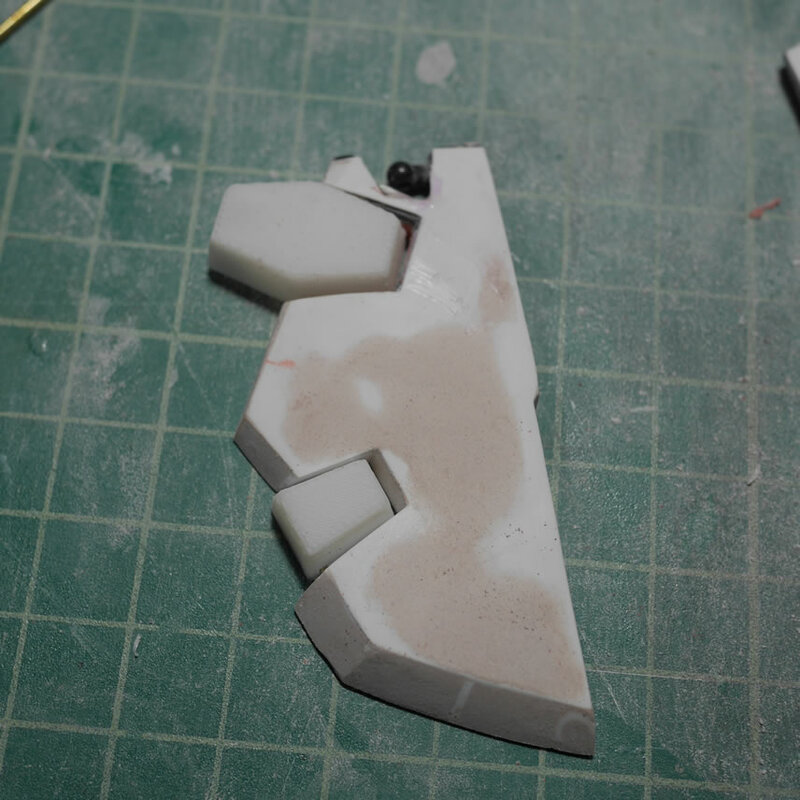 Test fitting as I go, the area is filed down and more plastic is glued on to align the bottom of the side skirts with the new front skirts. 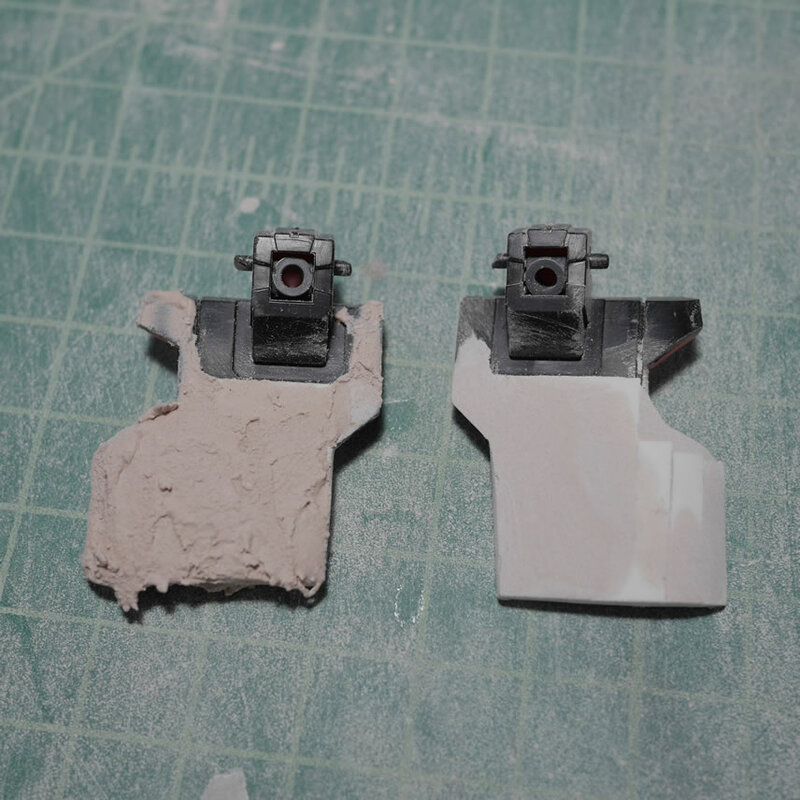 Once the side skirts were cut, styrene is glued into place on the front as well as on the back with supports (for the polyester putty to stick). Then the skirts are puttied and sanded to resculpt the shape. The process is pretty simple, but fairly labor intensive and a test in patience for things to cure. 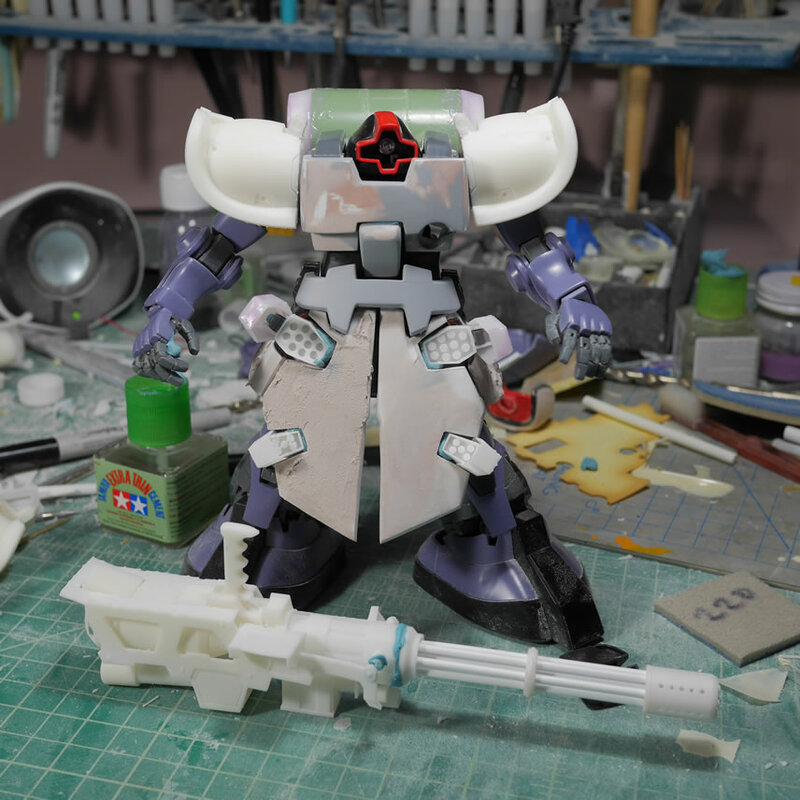 Always test fit. Never build assuming things will fit. Bandai spoils us horribly. Whenever we go outside the kit’s original design, things go south pretty quickly if you’re not constantly measuring and test fitting. The pods are test fit and opened to make sure everything still works and there is room for the pod’s opening functions. 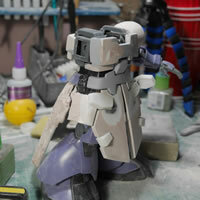 The test fitting continues through priming just to ensure the clearances are correct. 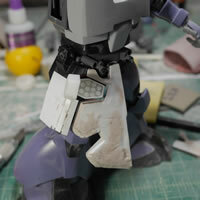 I marked the front skirts to help with the additional putty work. 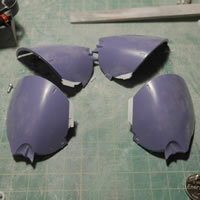 With the pods for measuring, I can now get the final shape of the skirts down. 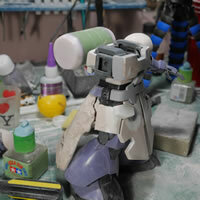 I am doing nothing but adding more putty, then sanding and more test fitting. 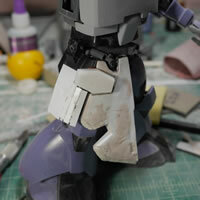 The rear skirt gets a few rounds of sanding and test fitting as well. 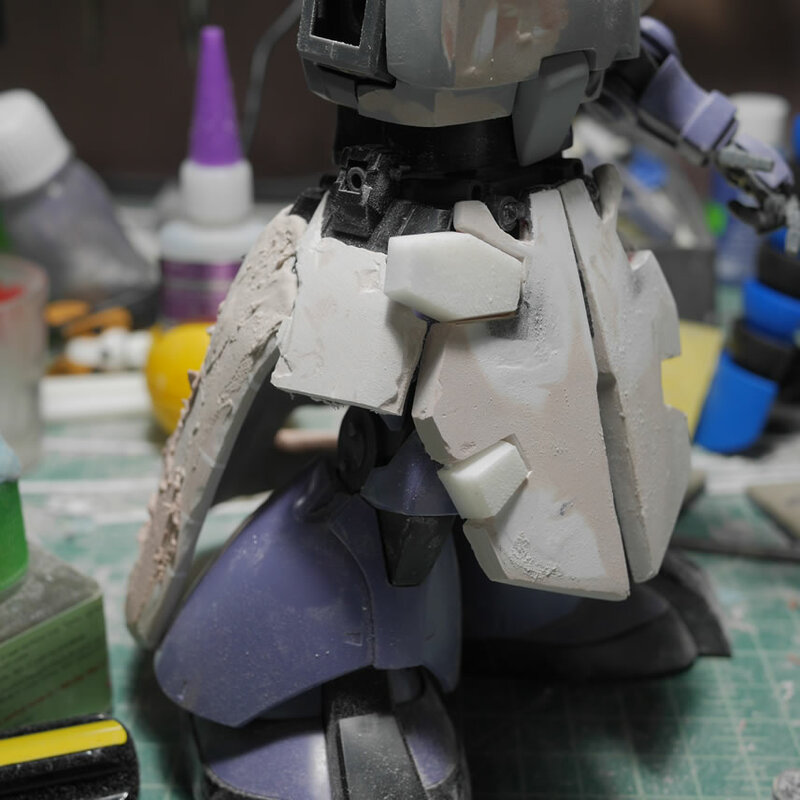 The rear skirt is starting to getting pretty heavy. 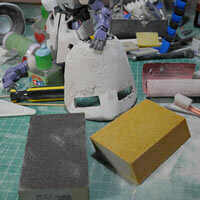 I think the polyester putty may actually be heavier than a solid resin block. It has been a good couple of minutes since I last posted and these pictures are at least a month old. It is hard to remember what I did without the notes that I write while things are still fresh. 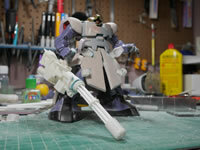 But I’m guessing that I did more test fits and more sanding. The front chest piece is coming together. 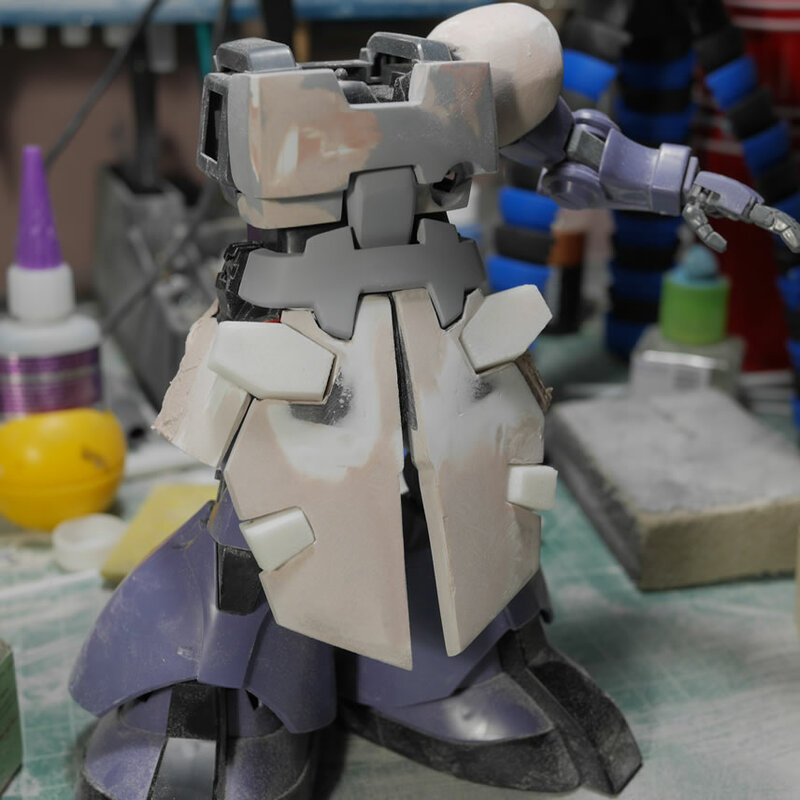 The shoulders are getting some putty work, but I’m seriously slowing down and avoiding the shoulder work because I am seeing the same issues I will have as I did with the front skirts. Symmetry. The skirts are coming along and you should be able to see a difference in the shape in these pictures compared to earlier in this post. The transition between the lower pods and skirt is more uniform and show makes a little more sense with the lines of the skirt. 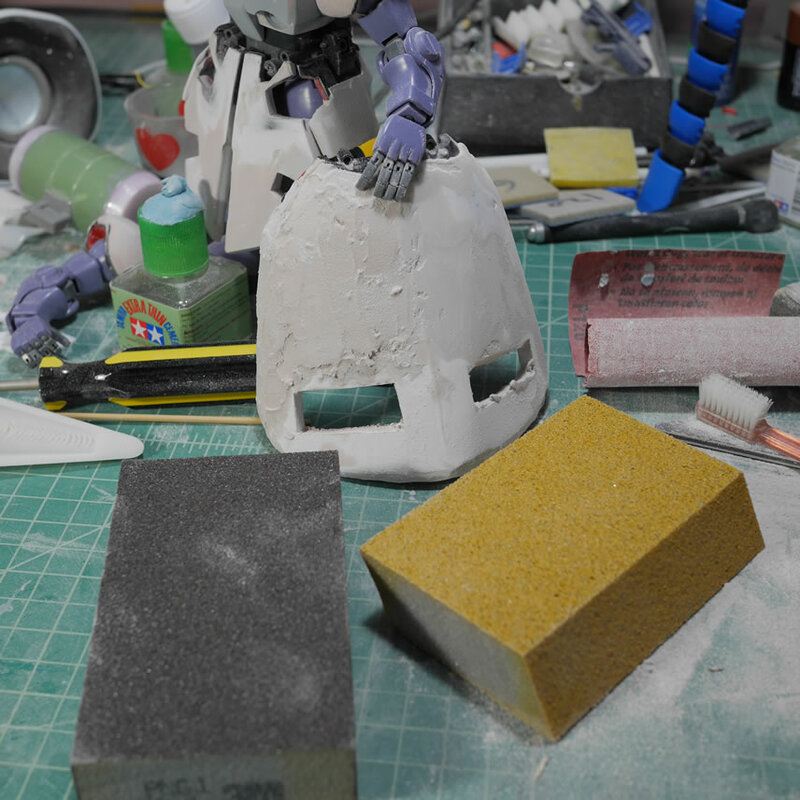 As I sand and sand, I’m constantly cleaning the putty dust off the work area. 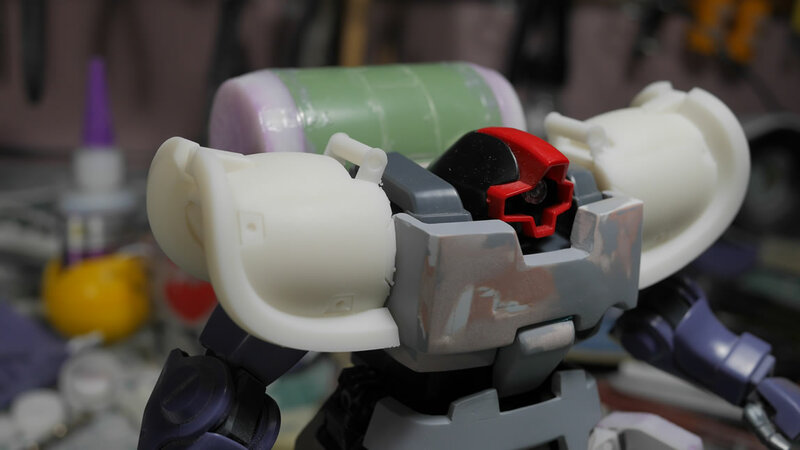 Work was getting late into the night which then told me the Dom needed a little pick me up, so I gave him a styrene tube and cut some lines for him. *SSSNNNNOOOORRRTTT* Ok, we can get back to work. Things look deceivenly smooth. 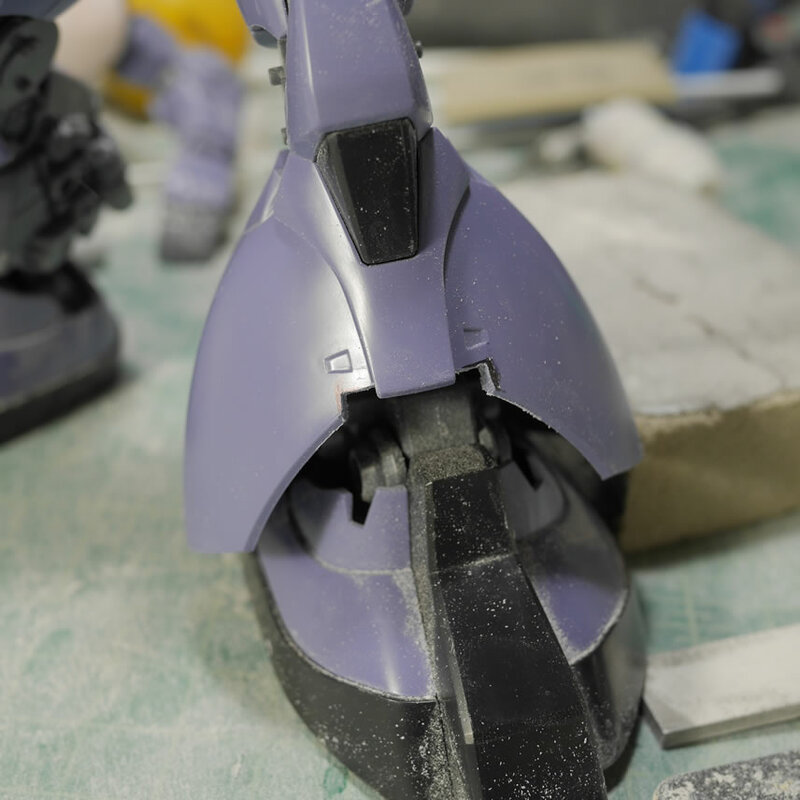 A layer of primer will really show off the surface. Taking a quick break from the skirts, I move down to the legs. 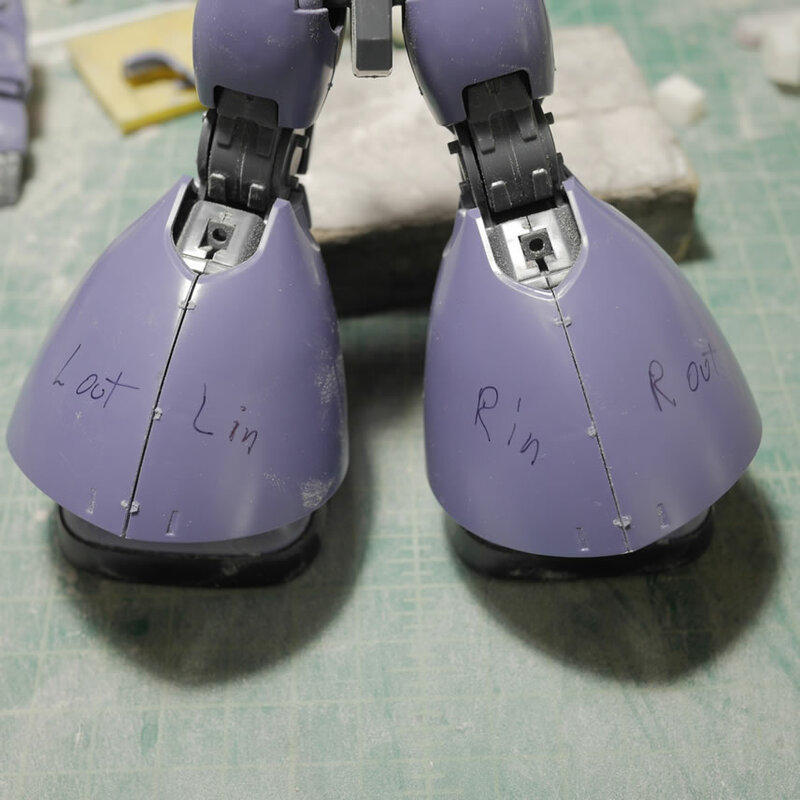 I will need some surgery to the legs so first things first, mark off the parts of the legs and LABEL everything. I don’t want to be working on a specific axis for what I think is a particular section when it isn’t and completely F things all to hell. Lessons learned from previous modification projects. 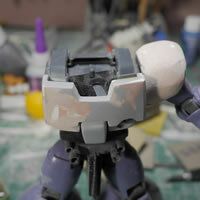 Permanent marker the crap out of things so that the part you are working on is the correct part. Some cutting is done and some styrene is glued into place and the legs are pushed to the project’s backlog and forgotten just as quickly. 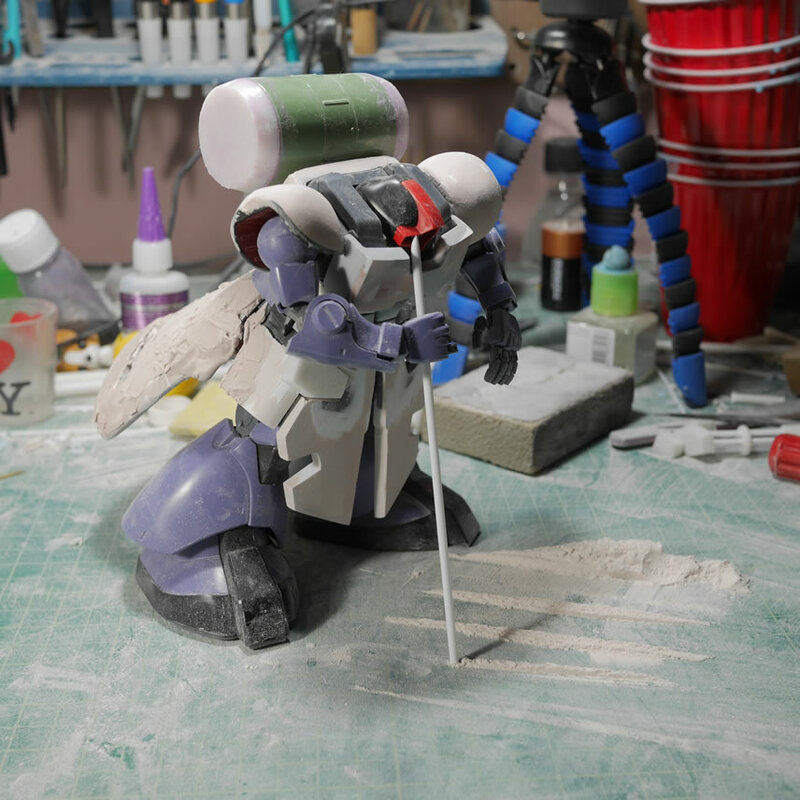 This is about the time I got the Exceed RX-78. And a week after that, I got the Form 2 SLA 3D printer. 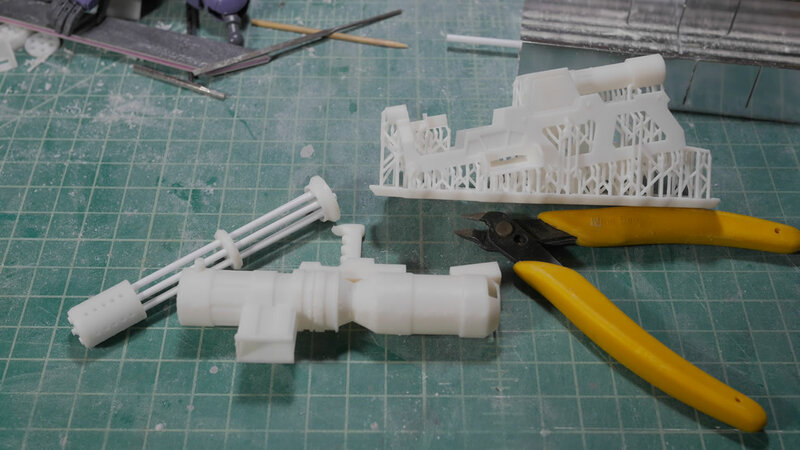 So having done enough testing, I want to revisit the gatling gun that I had been working on using the FDM printer to help augment that build. 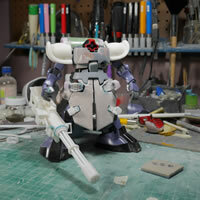 My originally built gatling gun melted after I had placed the whole assembly into an acetone vapor bath for too long. 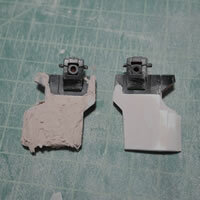 I was using the vapor bath to help dissolve the resolution lines from the FDM printed parts. 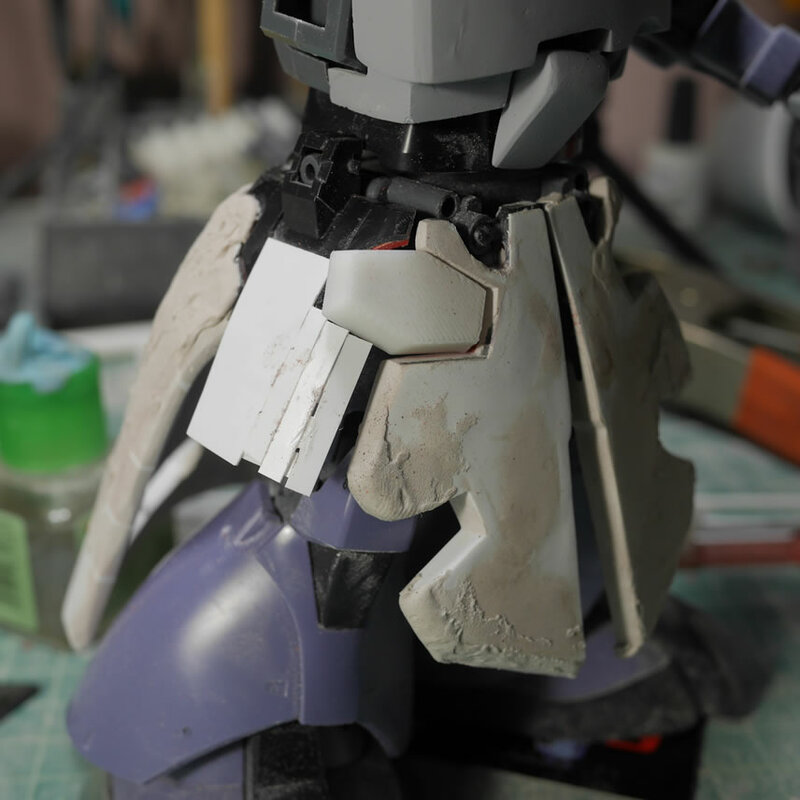 The side effect for vapor baths is the loss of sharp details. 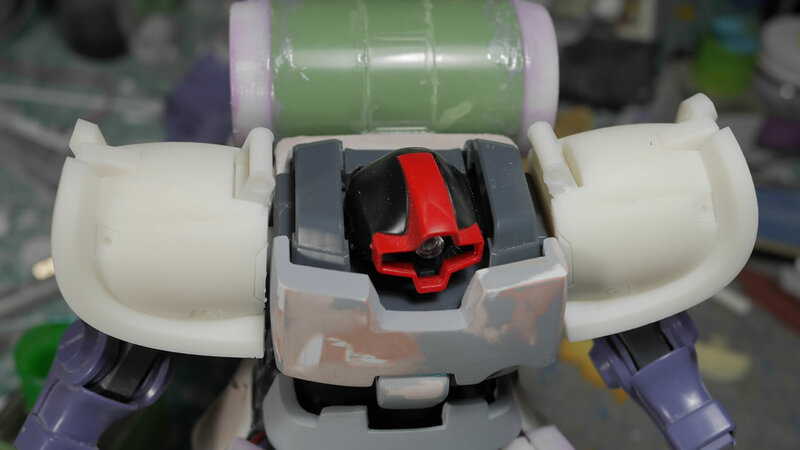 So if you were going for rounded parts, this works. 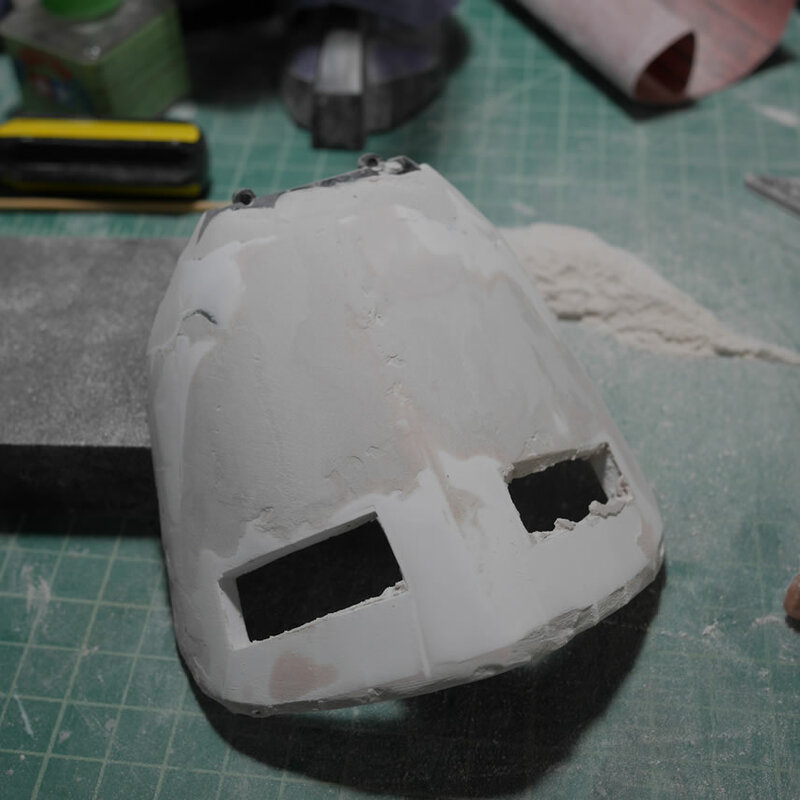 If you want very sharp corners and details, avoid at all costs and just go with putty and sanding to fix the .15mm(highest level of resolution with the FDM printer) resolution lines. 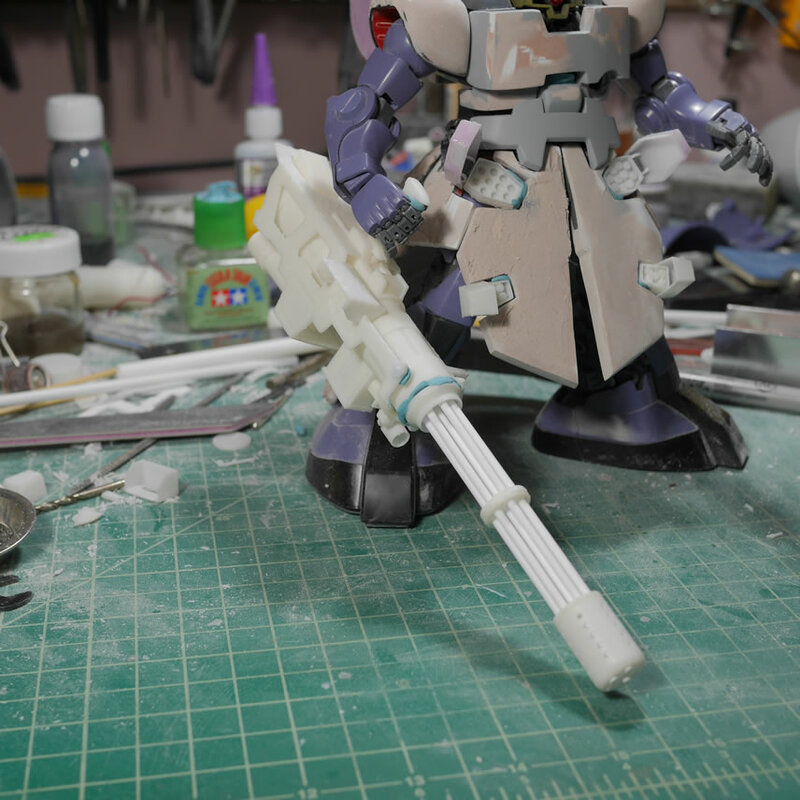 Since I melted the original gun. 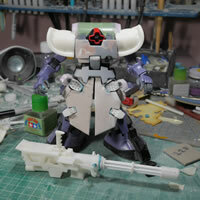 Time to build a new one using the same 3D files from the FDM print and print them out using the new Form 2. The results are not bad as seen in the comparison shots below. 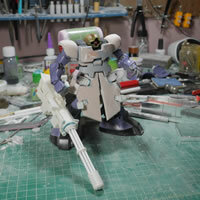 I can continue forward and start on the frame. 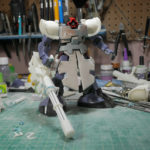 Originally, I had cut out styrene using the cricut die cutter and a drawing of the gatling gun’s frame from reference pictures. The lack of precision bothered me a little even after sanding, so since I had the Form 2 now, I can probably print the frame as a whole. 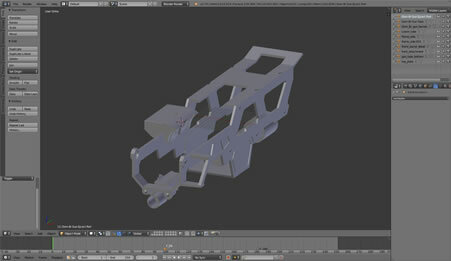 I went back to blender and designed the frame from the ground up. 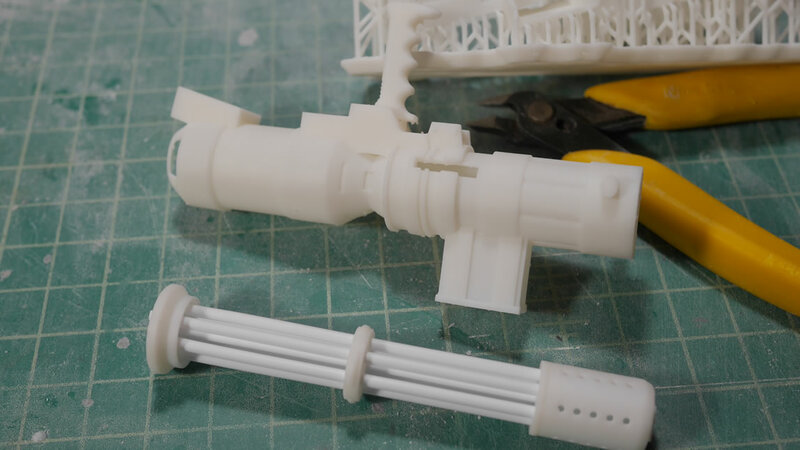 Since that worked sorta worked out fairly well, I kept going and decided to redesign the main part of the gatling gun(for which I had already printed out with the first set of 3D files). I needed to check the size references with the newly designed frame with the main gun, so why not. 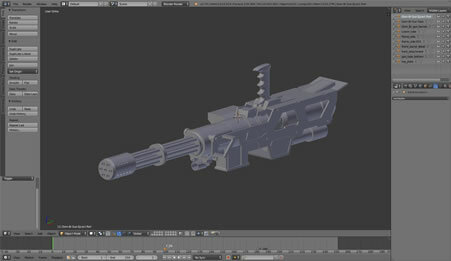 Scrapping everything I did earlier for the main gun round pieces, I started from scratch and redesigned the main gun with what I had learned all the new techniques I learned thus far. 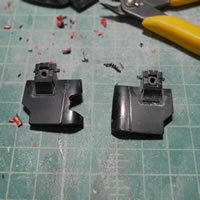 The ejection port was redone as well as the ammo feed port. I mocked up the barrels so that I could get a better proportional view of the whole gun. 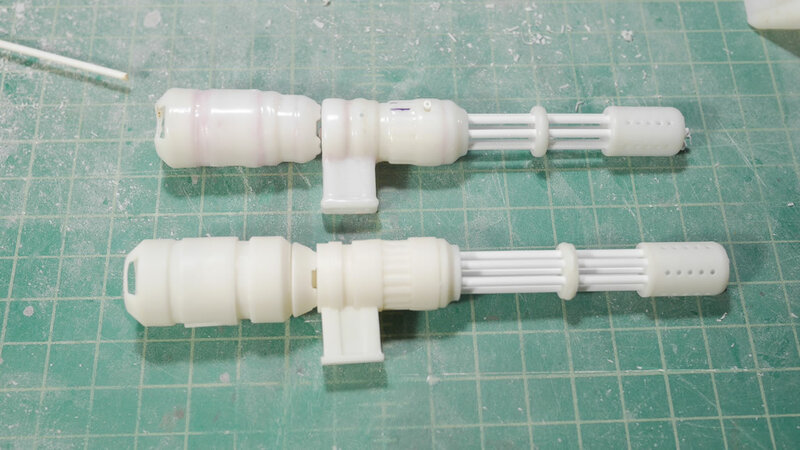 The actual barrels will be styrene tubes, but everything else is 3D printed. 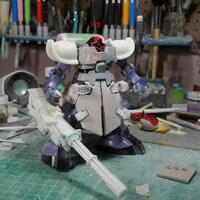 I spent a few hours a day on the design and after about 10 days, I had two parts for the gun. The frame and the main gun piece. 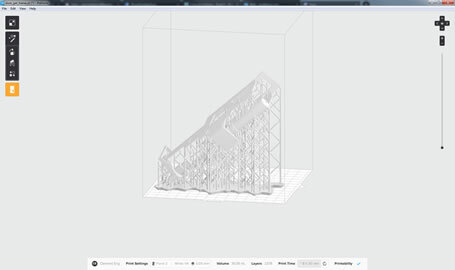 The design is opened on the formlabs preform software. The software is very user friendly as it fixes some really crappy designs so that it can be printed. 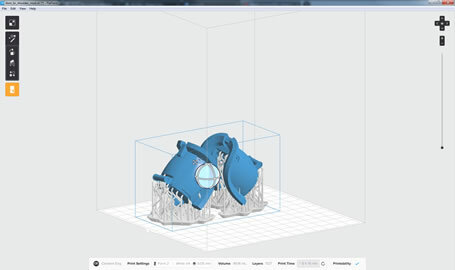 Supports are generated and the printability is checked and when ready, its a click on the preform software to send the object data to the printer and then a touch on the printer’s touch screen menu and click of the one physical button on the printer. Set it and then forget it, ala Ron Popeil. 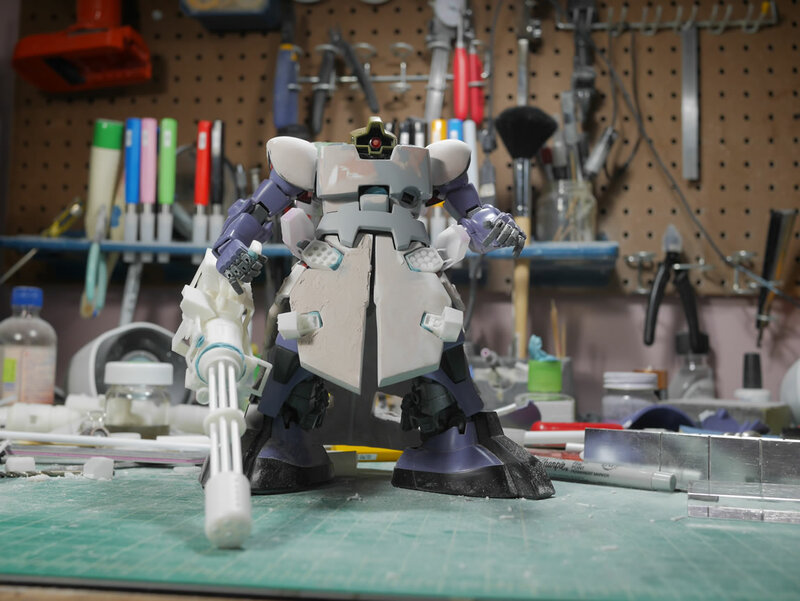 The thing takes about 10 hours to print. The original estimation put it at about 6 hours. After the print, the resin needs to be cleaned up, so the first step is an isopropyl alcohol bath. 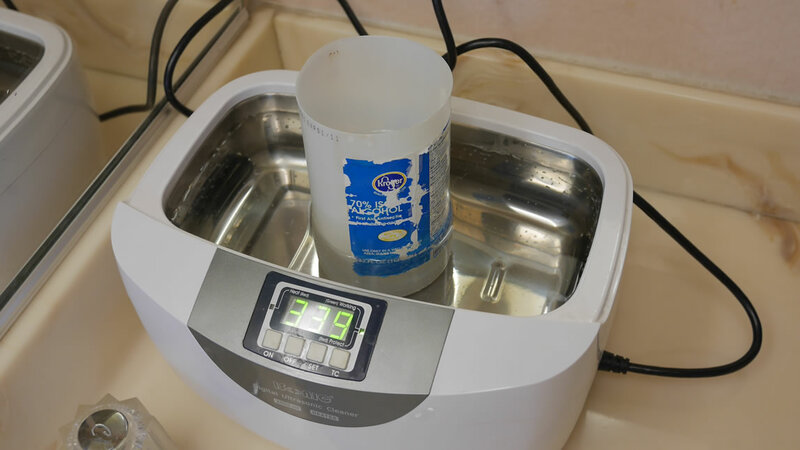 The part is supposed to soak for about 20 minutes, so I move a step up by putting the soaking tub into the ultrasonic cleaner and running in for about 15 minutes. 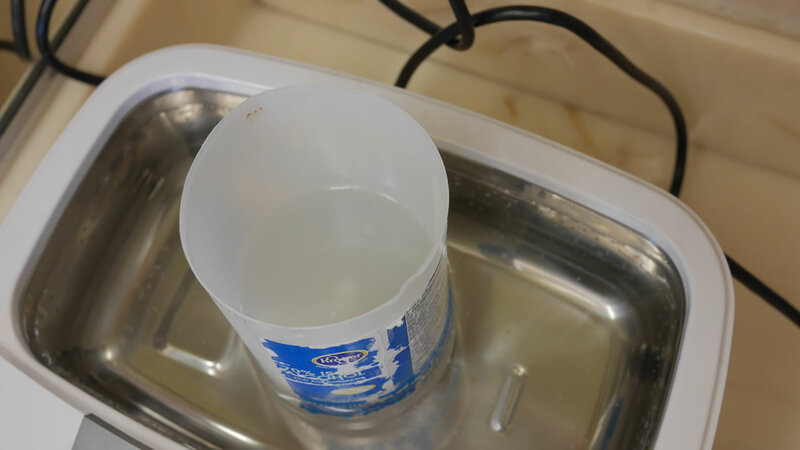 All the excess uncured resin is dissolved in the alcohol. The print is then dried off and thrown under some UV lights to cure. The Form 2 package came with a nice UV lamp that fits into the dehydrator, so combining the two, I have a heated curing station. The dehydrator is set to 95 degrees for a half hour and the part is placed into the UV lamp assembly and in half an hour, the part if completely dry and completely cured. 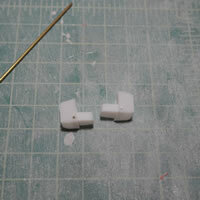 The supports are carefully removed; read clippers to cut the pieces off. 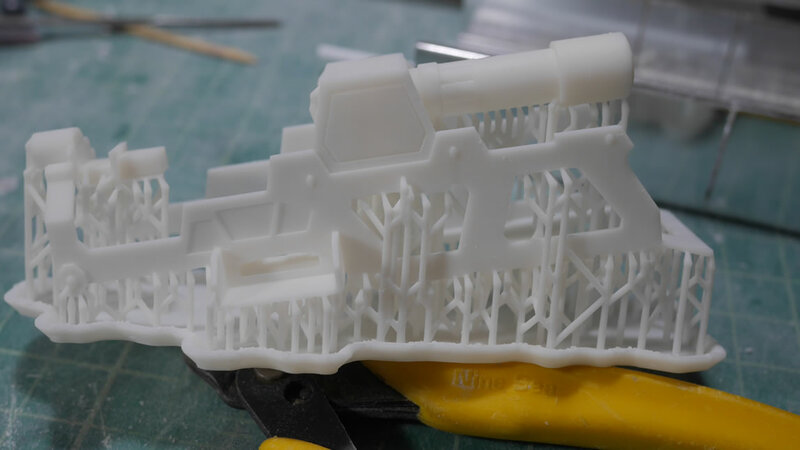 If there are supports in delicate areas of your print, it is best to clip the supports off and sand the nubs than trying to break them off with your fingers(because the supports break off fairly easily with light pressure from your fingers). Guess how I learned that lesson? When I designed the main gun, I also hollowed out the tube. This saves on print time as well as resin costs. A liter of the resin costs about $150. So it is a damn good idea to design your objects with that in mind. 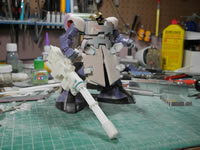 And now the moment of truth, test fitting to check the scaling with kit. I had built the front barrels a total of three different times using different lengths. 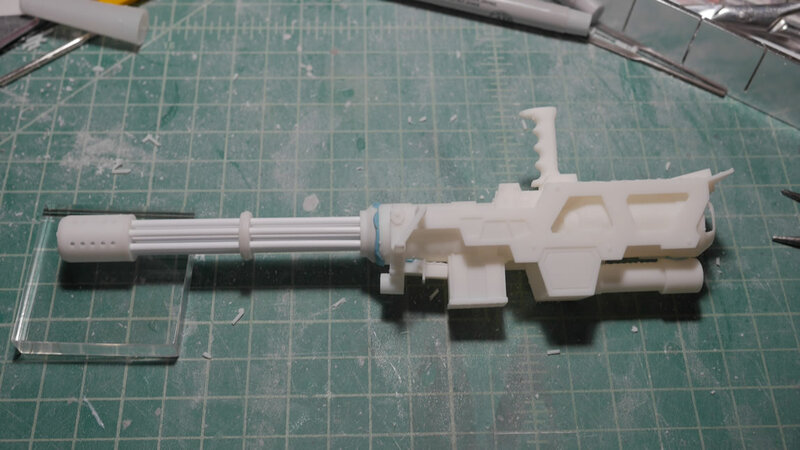 The first print of the main gun was too long, so I shortened it and I think the scaling looks correct. It is a massive gun, but shouldn’t be so massive that its completely out of scale. The really nice thing about a 3D design is that you can always change up the scaling to get a better fit. 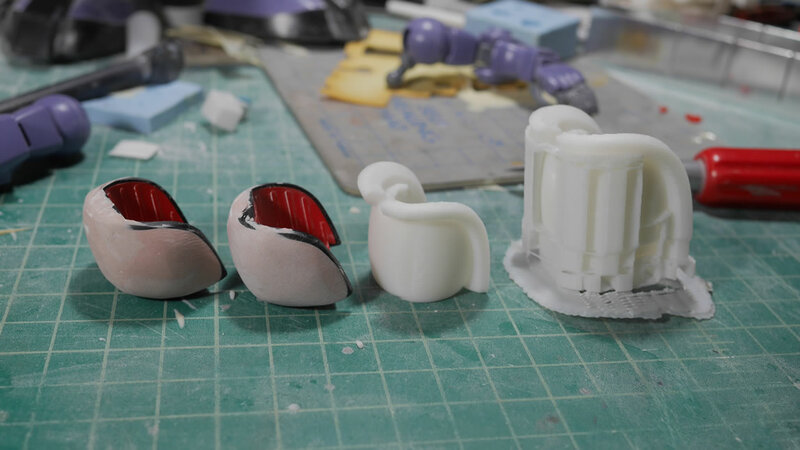 This will come into play later; but when testing the fit and size of the design, it is great to have an FDM printer to do all this throw away work a fast print using cheap ABS/PLA materials before getting the scale correct and printing on the very slow SLA with expensive resin. I grabbed several angles to make sure the scaling looks correct. 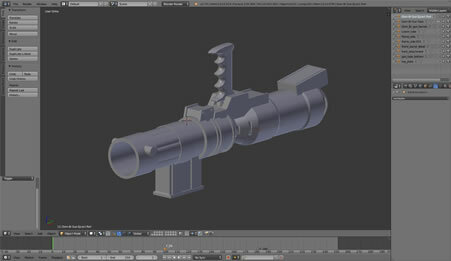 The gatling gun is officially my first almost fully designed 3D part. 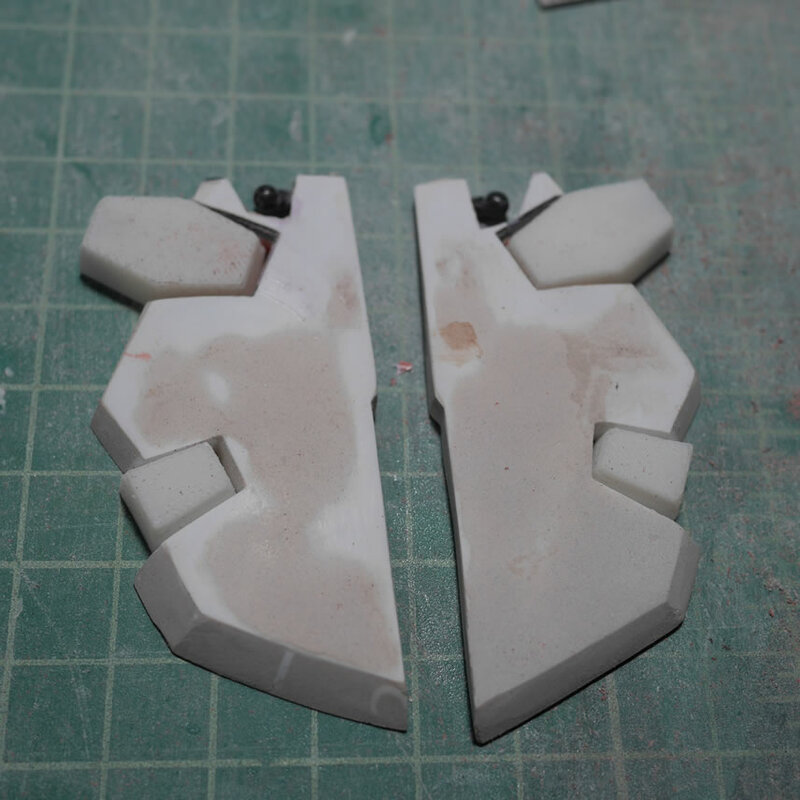 With the FDM, I’ve always designed augment pieces. So I’m pretty proud of the fumbling around in Blender that resulted in this piece. I definitely learned a great deal while designing and printing. Feeling pretty confident in my Blender skills. I moved over to Zbrush as I took a class on the software last year. I had forgotten a HUGE amount of the damn class; but I took notes and looking over them, quickly reminded me on what I needed to do. 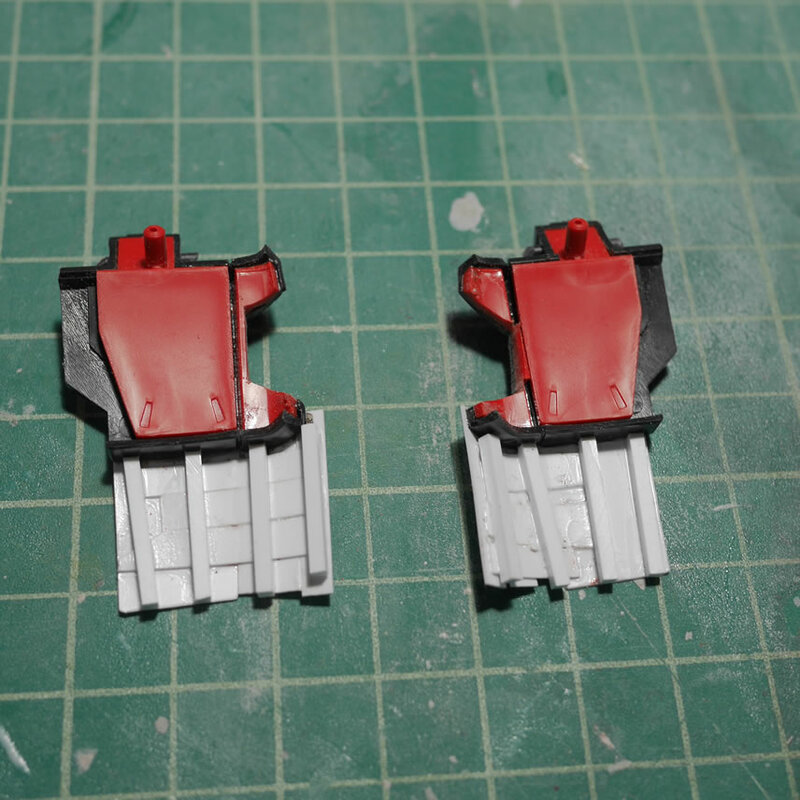 Since I was fairly successful with the gun, I wanted to try my hand at doing the shoulders. Earlier, I had touched on the problem of the shoulders with symmetry, or rather, the lack of and the attempt to achieve it. Since the shoulders are a round shape, I figured zbrush was good for sculpting. 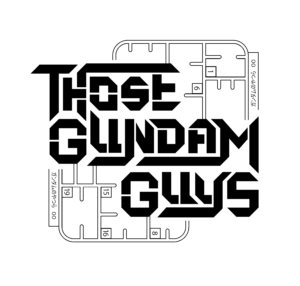 The software has a feature that makes the UI transparent and then you can have a desktop image of your reference and turns the software effectively into a light table. Using zbrush’s timeline feature, you can lock the position of the design at different view angles and easily slide between them while you sculpt. It is a pretty cool feature. But I quickly learn that I’m not familiar enough with zbrush so that idea gets abandoned after about a day’s worth of trial and many many errors. 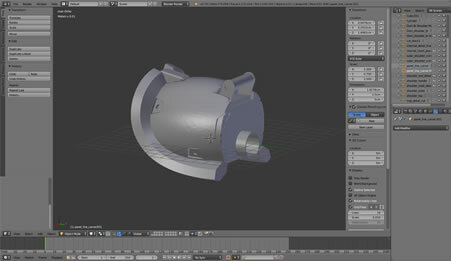 Back to Blender. 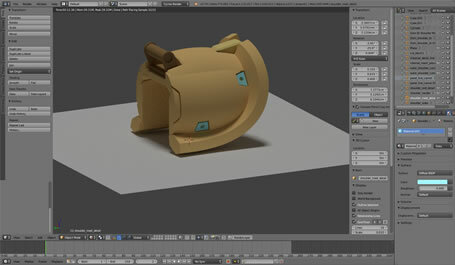 Blender does have a similar feature where you can import your reference pictures and get the same light table effect. But I haven’t figured out how to get it as smooth as zbrush in switching between views and locking down those views while i work on the design. Another week or so is spent to design the shoulders. The nice thing here is that I only need to design ONE shoulder. I started with the inner shoulder piece and after measuring distances, just designed that with straight cubes and cylinders. At this point, I hadn’t figured out how to do the rounded shapes or even the rim for the shoulder. 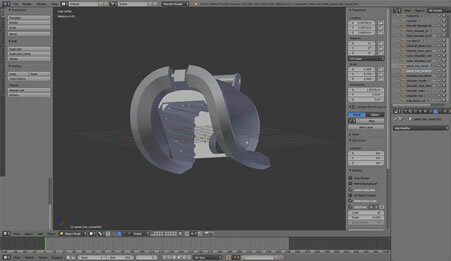 A few youtube videos later, I discovered the Nurbs Surface. 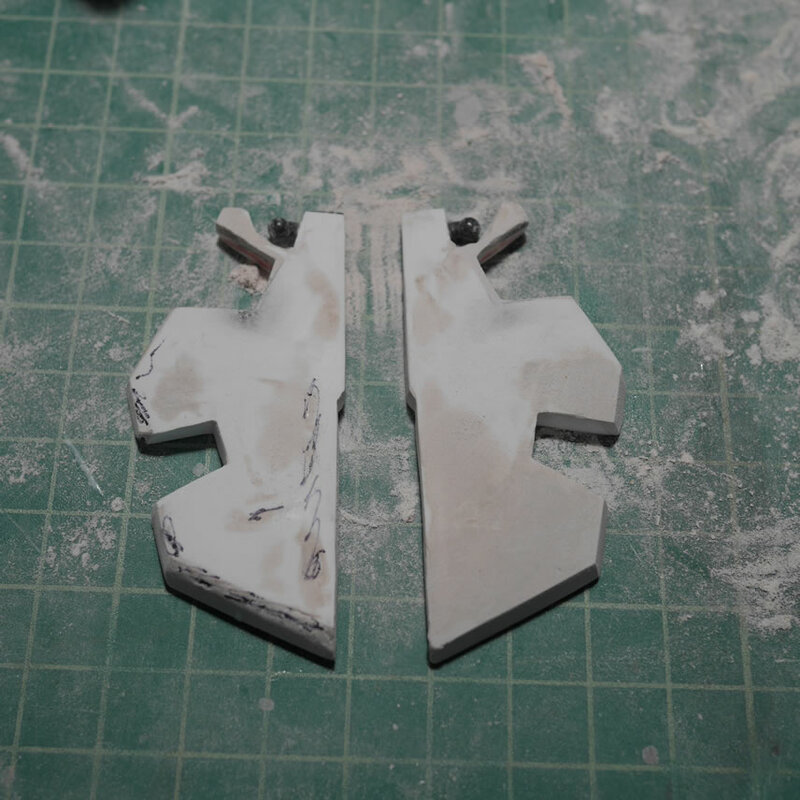 Working with this, and the mirror modifier, I was able to get a pretty close representation of the Dom’s main pauldrons for the sides of the shoulder piece. Some more youtubing and I learned about using bezier curves to create the shoulder rims details. Once the top was done with another nurbs surface, the rest of the details were fairly easy. 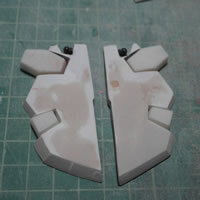 The shoulder bar as well as the free floating detail piece at the outer end of the shoulders were simple shapes and cuts. 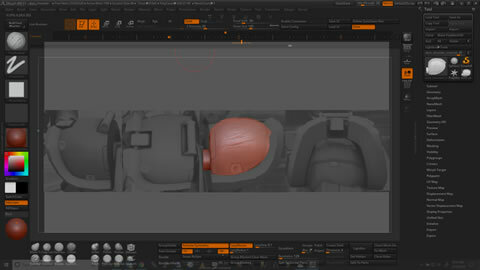 The scribbled line as well as inset details were done too using simple shapes and booleans. 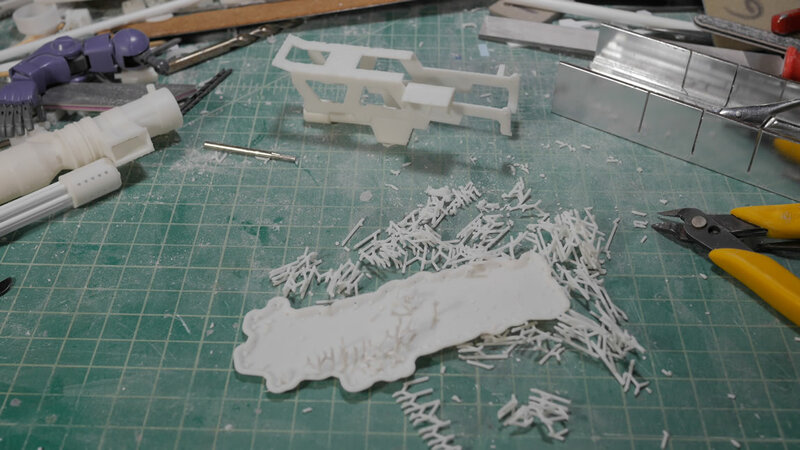 The whole project took several hours every day for about a week before I was ready to actually print the thing. I have a rendered colorized view, another blender feature I learned to get another visualization for the designed object prior to printing. 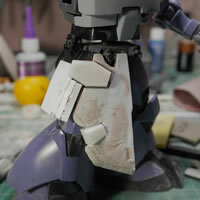 I designed shoulder to have separate elements such as the end details pieces as well as the inset details. 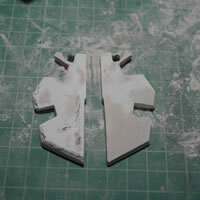 This way, I can do a quick print on the FDM to check for sizes using the base shoulder piece. 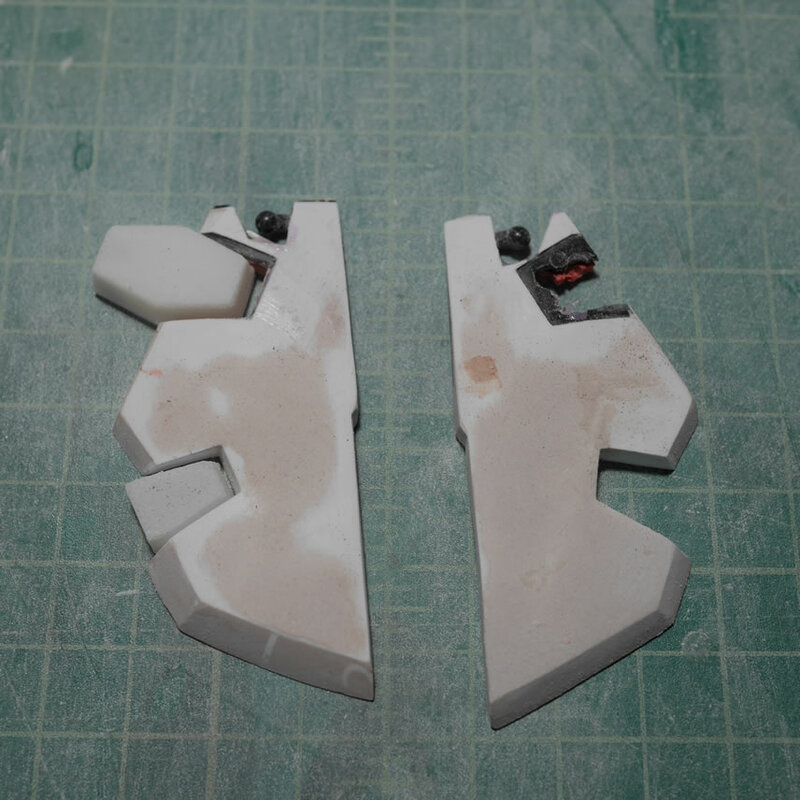 In hindsight, I could have just tested this against the internal shoulder piece I modeled first and that would have saved even more ABS and print time. The first print was too small, so I made the adjustments and printed again. My FDM printer shifted a little during the print (as they sometimes do if the table shakes or something odd happens). 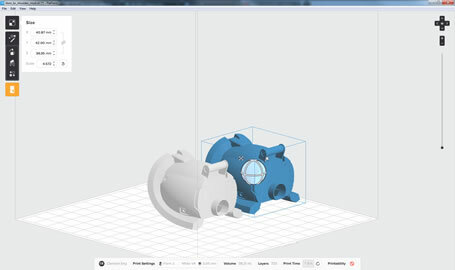 But the printed part is a good fit so I know the dimensions I need for the SLA print. Design one shoulder, print two. 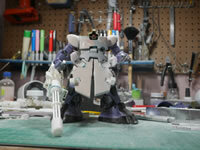 With the scaling done, the part is sent to the Form 2 to print for the next 6 hours. 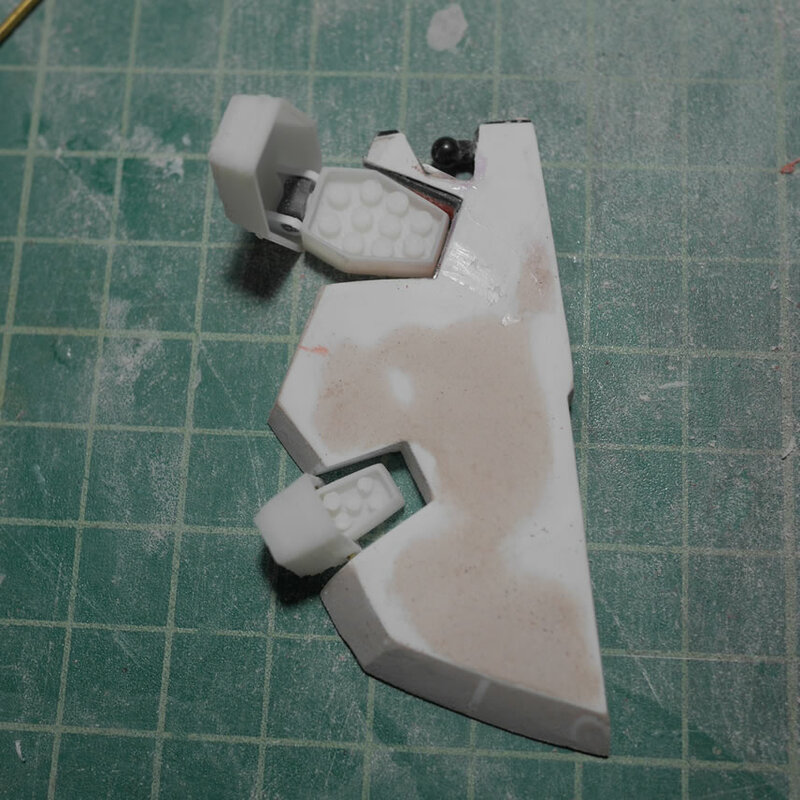 6 hours later, the print is done and I do a test fit with the arm and everything looks good; almost. 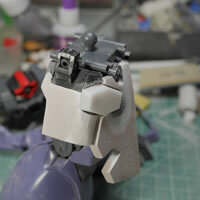 I do notice that the end detail did not print correctly and the ends of the shoulder rims are not completely printed. This is a design mistake and not a printer error. 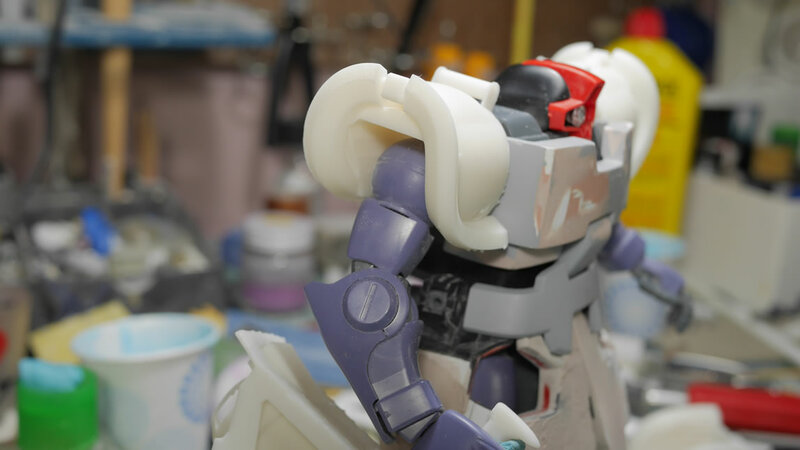 That detail piece was designed as a free floating piece that is connected at the end of the shoulders – since the reference pictures showed this as a free floating part. To fix this, I needed to add a mesh from the main shoulder piece to this detail part. Lesson learned here is to make modifications and judgment calls when following exactly with the reference or deviating when necessary. 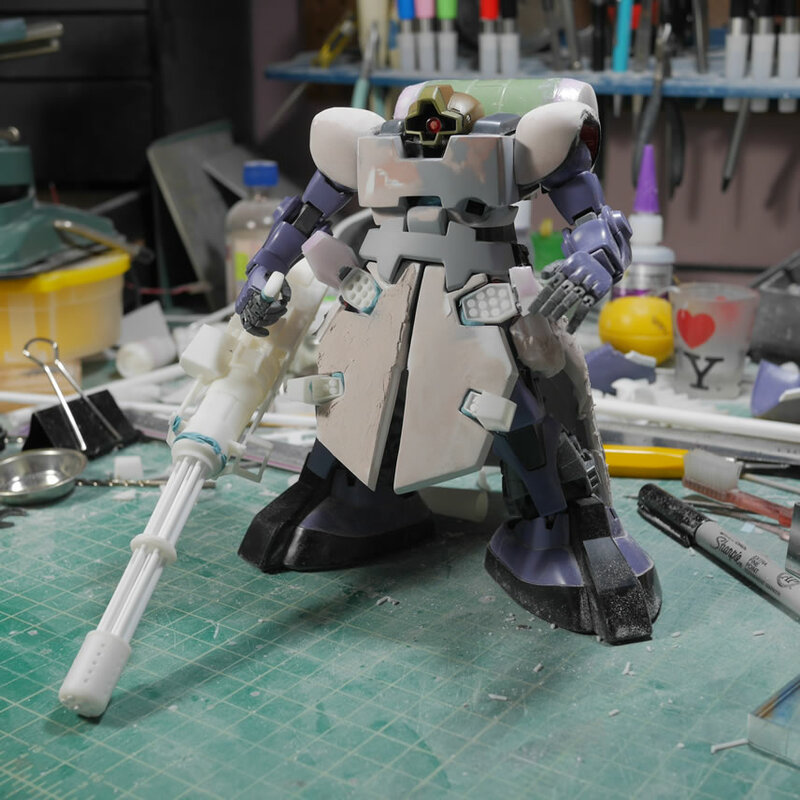 Here is a mock up with the Dom with the first shoulder print. 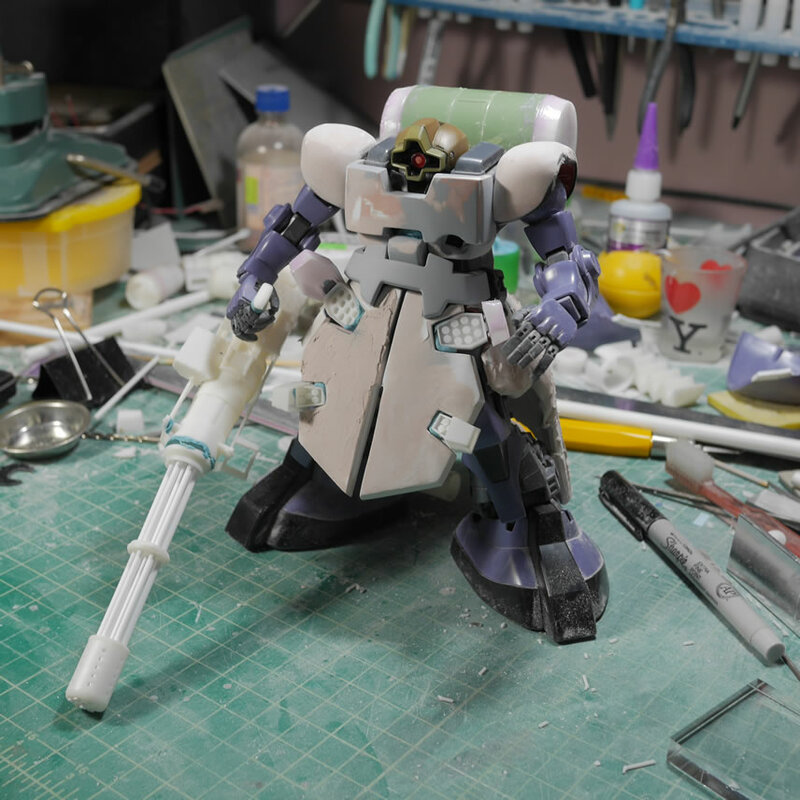 I’m getting a Kondo style feel here, but this feeling doesn’t hit me until a bit later. 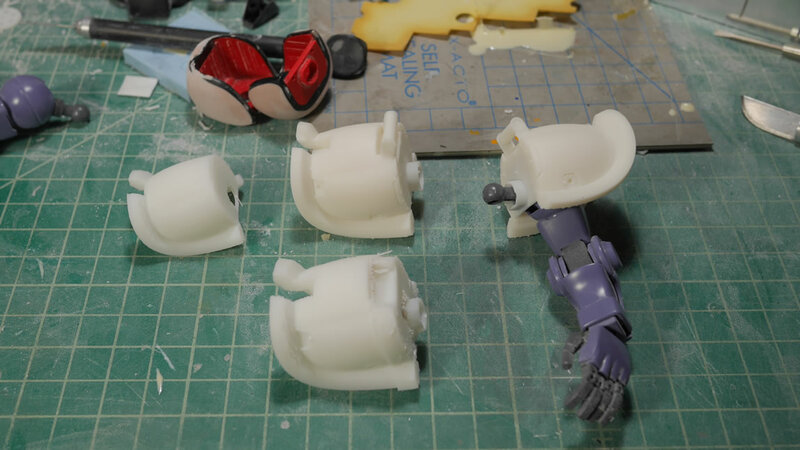 Another 6 hours later and I have the correctly printed shoulders. 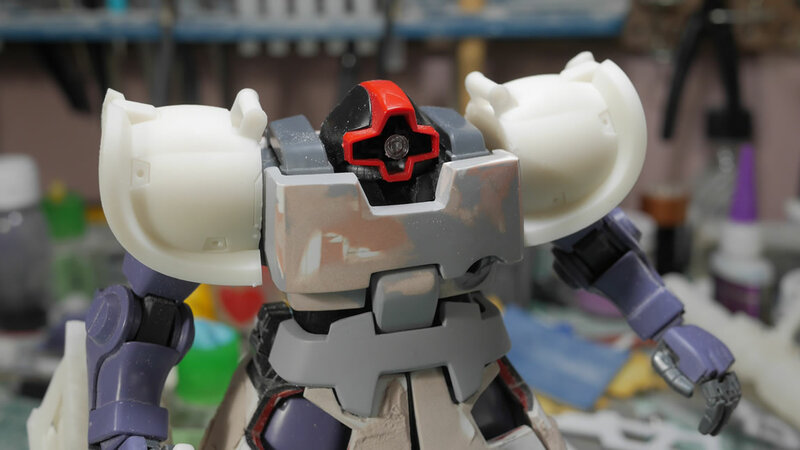 You will see that the end of the shoulders are not missing now. This is a good lesson in print orientation and limitations on what can be printed depending on the orientation. I let this sit for a day and then looked at it again and made a comparison to the reference pictures. The shoulders were a little too long. 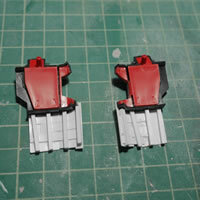 Scaling with the rest of the kit, they didn’t look correct to me. Again, that Kondo style feel is hitting me ever so slightly. 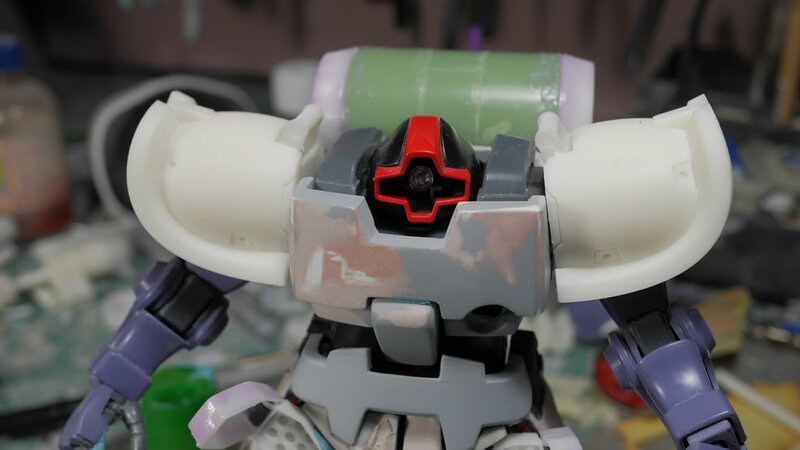 From the side view, there is just too much room from the internal shoulder piece. The internal area was a little too tight so that the shoulder ball doesn’t have room to move and is actually being held in place by the resin shoulder internals. 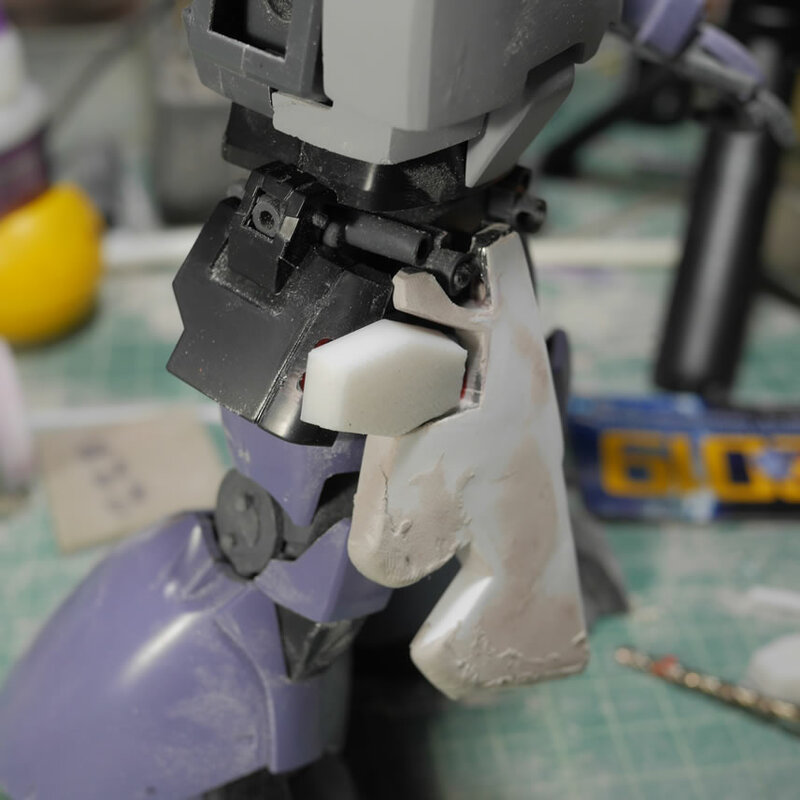 The cylinder connection point for the joint piece that juts out from the should ball is also too large and is not the actual area holding the arm to the shoulders. These are all things that I completely missed in the initial test print. I was a little overly excited to get the print sent to the SLA. Another lesson learned here. 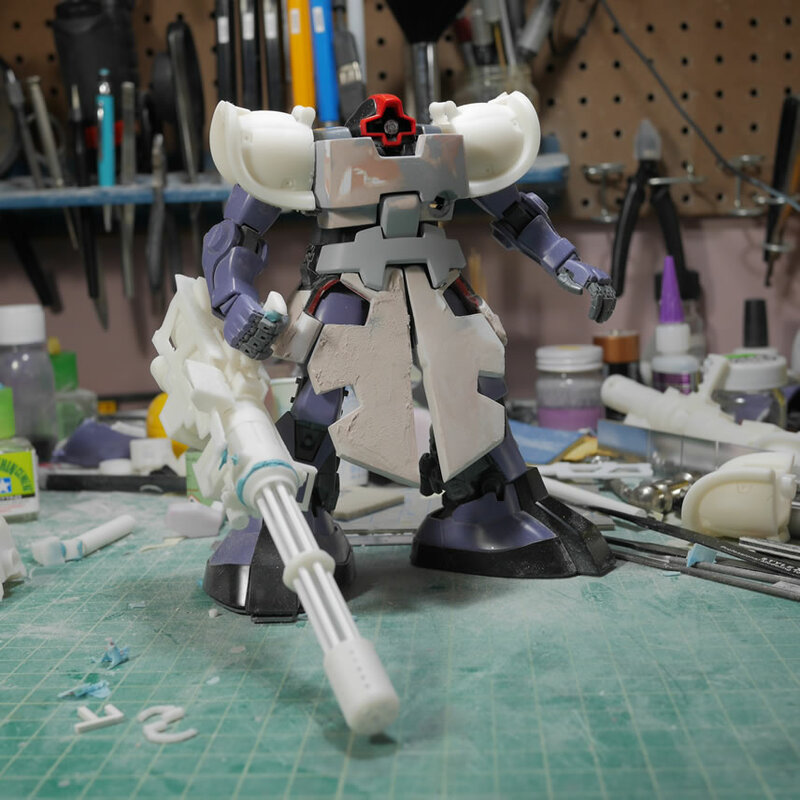 Patience is key, and would have saved me at the minimum of 12 hours of extra print times and resin. 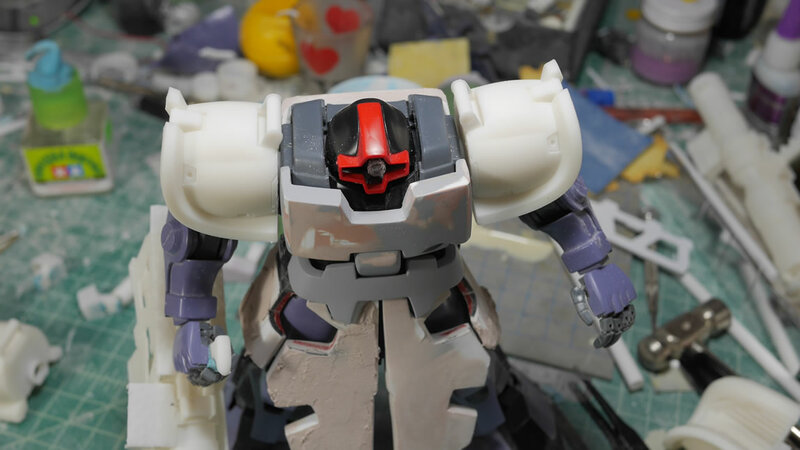 I went back to the 3D design and shortened the shoulder length by 4mm; this is small but in the scale of 1/100, this is about 1.3 feet of difference Small, but noticeable. The detail bits were adjusted to fit the new size. 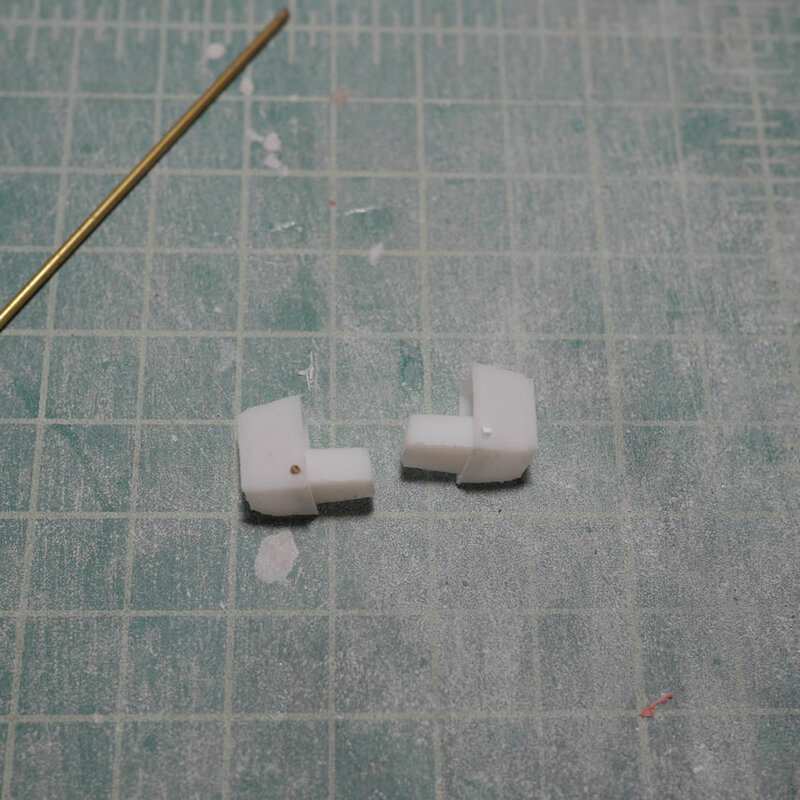 The original connecting cylinder piece was a little too thin so I thickened that up. It was still too large after printing, so I designed an insert that works to attach the original part’s frame piece. 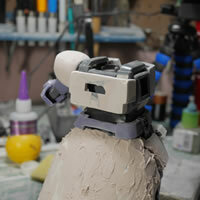 I widened the internal shoulder piece to give a little more room for the shoulder ball. 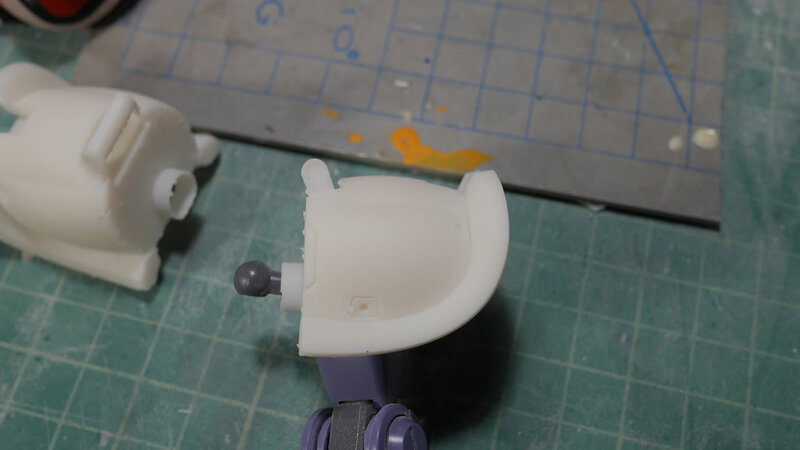 This made the addition of the round insert piece more important as the earlier print had the internal shoulder walls holding the arm in place where now the joint area is the contact point for the shoulder and the rest of the arm. How it should be. Another 6 hours later and I have the below comparison picture. 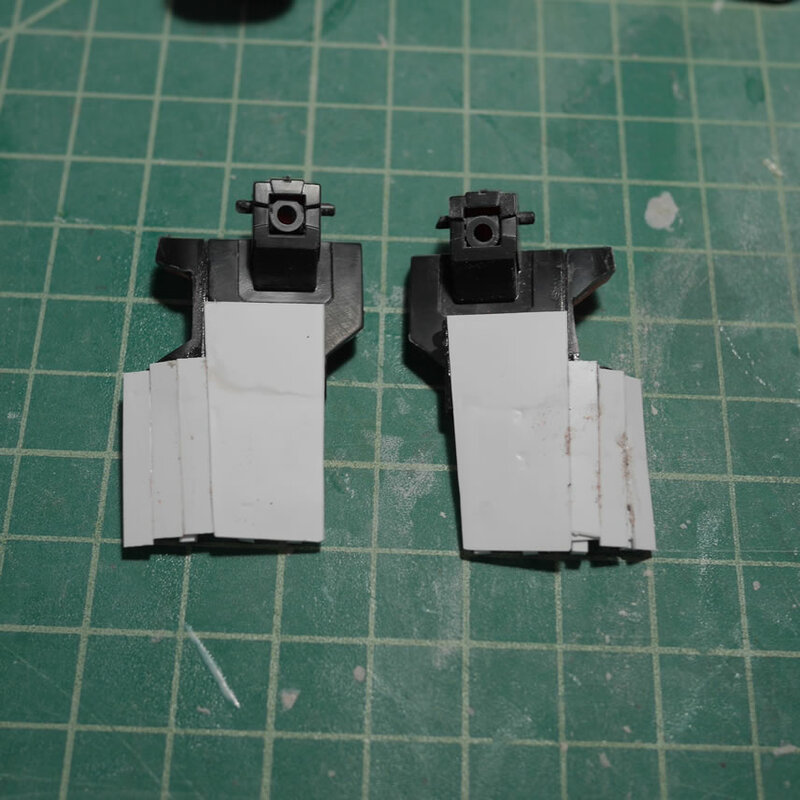 The left side is the first prints with the larger shoulders and the right is the shortened shoulders. 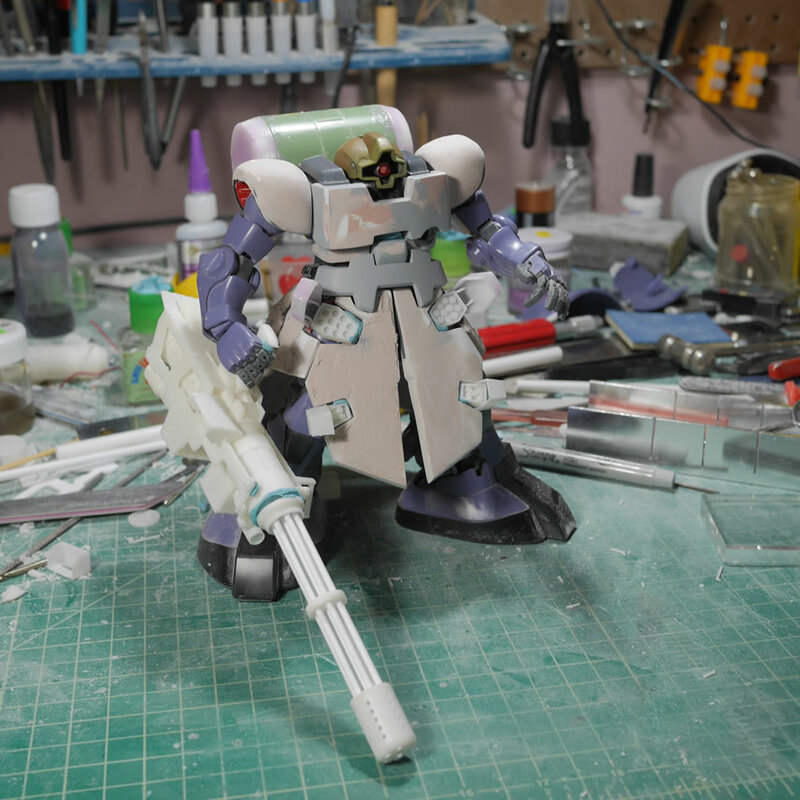 Looking at the whole kit, I think the shortened shoulders scale better.